I just learned of the children's book, The Crows of Pearblossom, written by Aldous Huxley while he was living in the Mojave Desert. It's a strange and creepy book. I'm including the climactic illustration below. It's the story of two crows trying to start a family. Their efforts are foiled by a rattlesnake who continues to eat their eggs. 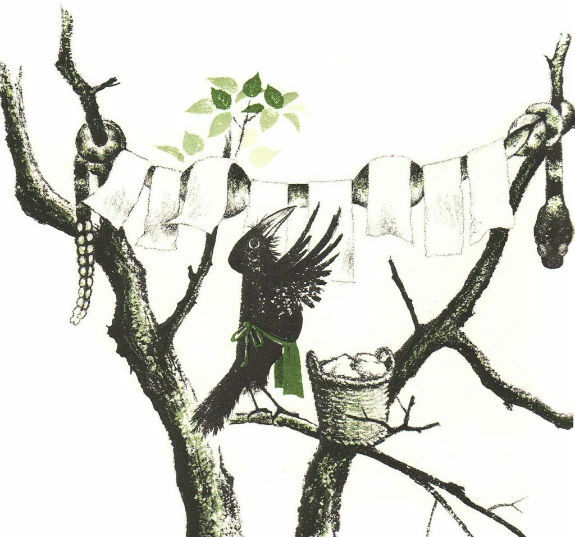 They win out in the end and Mrs. Crow uses the body of the snake to hang her children's diapers on. For more of the story and a more nuanced review, please read Amy Bronwenzemser.